Best to eat in sunny July. Grab a knife and slice it through. So happy that it’s not a dream. This pie is simple to make. I’m sure the purists out there are having a fit but time is a commodity that’s hard to come by around here. If I can find a quality ingredient that’s ready-made, I’m all for it, guilt-free. That’s how I feel about this dough. It can be found in any grocery store’s refrigerated section. Preheat oven to 450 degrees. 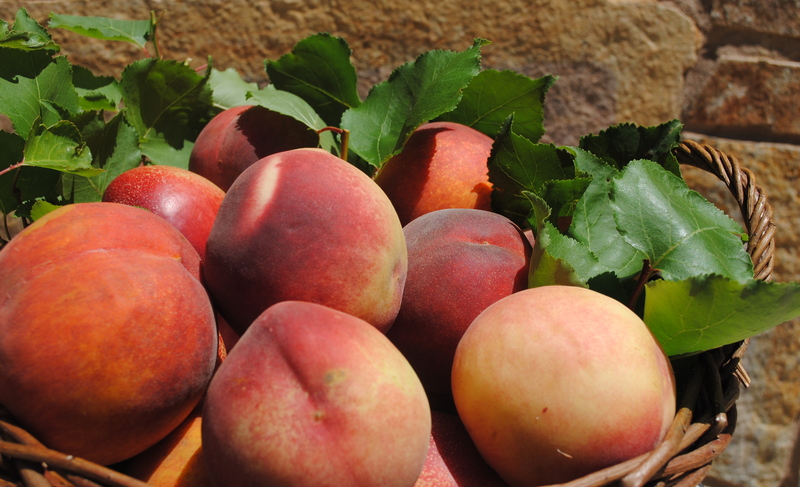 After the peaches are peeled and sliced, add them to a pot with 1 1/4 cups sugar. Add more or less sugar depending on the sweetness of the fruit. Cook on low for 5 minutes and add cornstarch. After the fruit has been slightly softened and the juice has thickened a bit, take the pot off the heat. Add the blueberries and gently stir. Use 1 T of butter to grease the pie plate. Lay the roll of dough over the plate and smooth the bottom and up the sides so there are no air pockets. 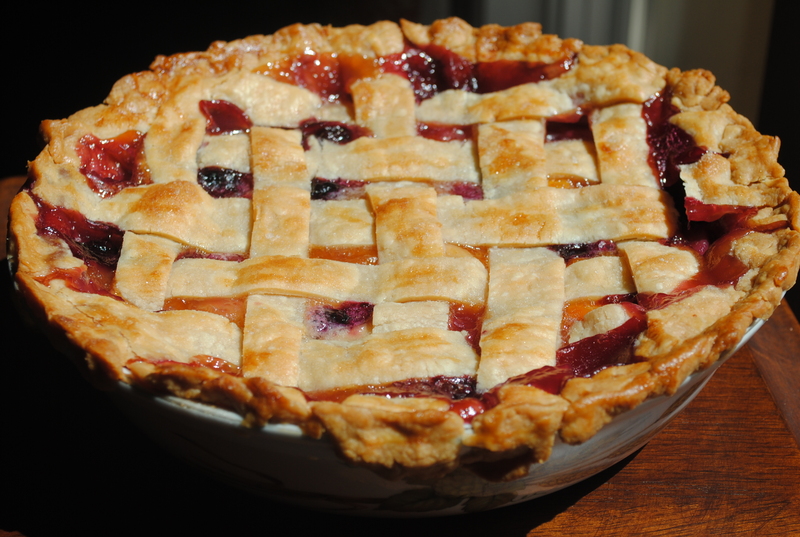 With your fingers, gently pinch or crimp the dough around the edges of the pie plate. Using the tines of a fork, lightly poke holes all around the bottom and sides. To ensure that the fruit filling is not too juicy, layer the fruit on top of the dough with a slotted spoon. If more juice is necessary after all the fruit has been added, then feel free to pour a bit on top. Place the last tablespoon of butter on top of the fruit in small pats. 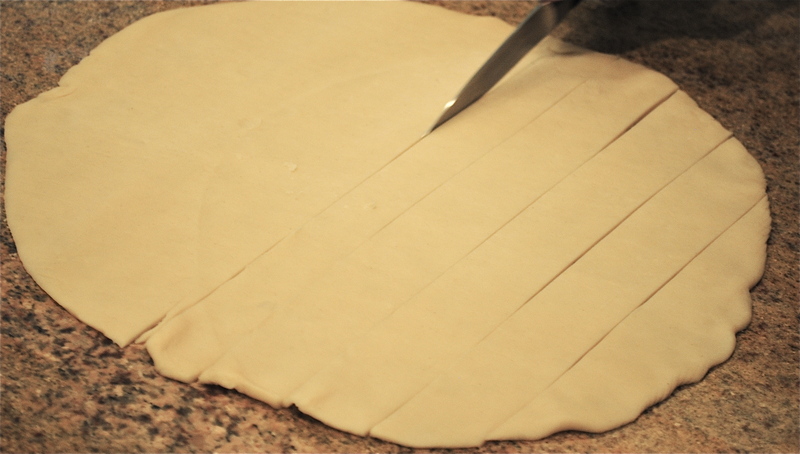 Unwrap your second roll of dough and lay out on a clean surface. With a small pairing knife or pizza cutter, cut the dough in 9-10 strips. Use the following link as a helpful guide to lattice the dough. Once in place, crimp the dough around the pie plate and brush the strips with egg wash. Finally, sprinkle the dough with 1 tablespoon of sugar. Place a pan on the bottom rack of the oven. The pie should go on the rack directly above to catch any drippings. Bake for 14 minutes at 450 degrees and then lower the heat to 375 degrees for the remaining 40-45 minutes or until the crust is golden brown. Let cool before serving. Serves 10. I love the fresh fruit flavors. The pie looks scrumptious. Now all I need is a scoop of vanilla ice cream and I’m ready to eat. Peaches and blueberries go so well together. There are good products out there that make life easier and I have no problem using them. 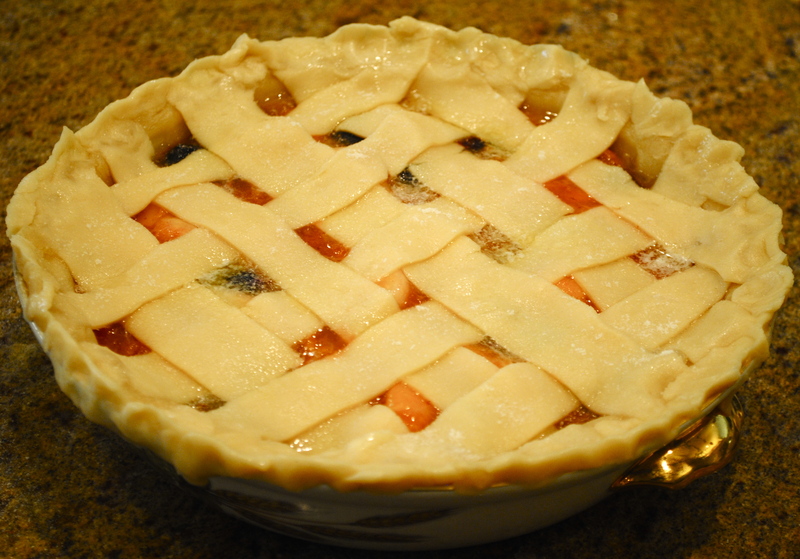 I made a peaches and blueberry salad once and loved this combo; I bet this pie would be a dream to savor! I will be making this soon, I have a whole bunch of ripe peaches in my fridge. But I’m sure that my lattice won’t be as pretty as yours.